Airplanes get you safely from A to B, but having TV, food and drinks is quite nice too of course. 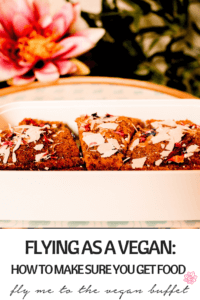 As we are still a minority, flying as a vegan can be a challenge. But since so many people have special dietary needs nowadays, most airlines offer a broad range of special meals that you can order in advance for flights of a certain minimum flight time. Luckily for us, there is usually at least one vegan option. This is of course the first thing you want to check. If you google “vegan meal” and the name of the airline, you will probably find a lot of information and even pictures and experiences that people have posted. So you can see if and how you can order one and what to expect, and if there are extra charges. However, even if you are able to order a VGML as most airlines call it, a couple of things can go wrong: maybe at the travel agency, maybe at catering, maybe even on board. Or due to unforeseen circumstances you could get rebooked onto a different flight at too short notice for catering to be able to accommodate you. It is a good idea to call the airline about 72 hours before the flight to check back if they have a record of your special meal. If not, that is still enough time to order it. On board, if you change your seat, inform one of the flight attendants. Sounds obvious, but you’d be surprised how often people don’t do that. Even better: write a little note with your name, original seat, new seat and vegan meal and hand it to them. When you are served your vegan meal, always check the label, including the hot meal and also the components. I have removed things from trays that weren’t vegan before. Of course talk to a flight attendant if you find non-vegan things, but keep in mind that they can only hand out what the departure airport’s catering company brought on board. The catering company brings what is needed for that flight according to their records. The flight attendants are mainly on board for your safety. They did not process the order or cook your meal. They usually don’t even have time to take a close look at the special meals. But they are able to report it back to the company if something was wrong and might even find some fruit or crackers for you, depending on the airline. If you are told that there is no record of your order, that is of course very unpleasant. In my experience that hardly ever happens, but it can happen. Make sure to inform your travel agent and the airline’s customer service. If they get no feedback, they can’t work on the problem. The flight attendants might be able to find something for you anyway, but of course their options are very limited. So I would always suggest bringing some snacks yourself. Maybe a sandwich. Or a pasta salad. And some cake? Or muffins? A focaccia? You can get cutlery from the flight attendants. Or bring your own, then you are even more independent. I’m a big fan of this ethical lifestyle toolkit. Keep in mind that a knife might cause problems at security. You also want to make sure the food is solid. 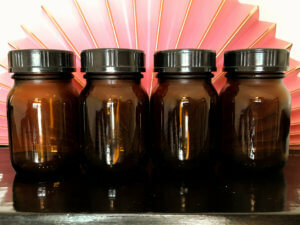 You can bring liquids up to 100ml in mini bottles that are either clearly marked or smaller to avoid problems. I use these 75ml bottles* from amazon. Spreads like hummus and peanut butter might count as liquids too and so can food with sauce. For flights from the U.S., the TSA has published a list of what you can bring. If you want to be on the super safe side, a tip from one of my readers is to contact the airport before and ask if you can bring specific food and ask for a written confirmation. Also keep in mind that due to country regulations you might not be allowed to import some things at your final destination, e.g. you usually can’t bring fresh veggies or fruit to other continents. 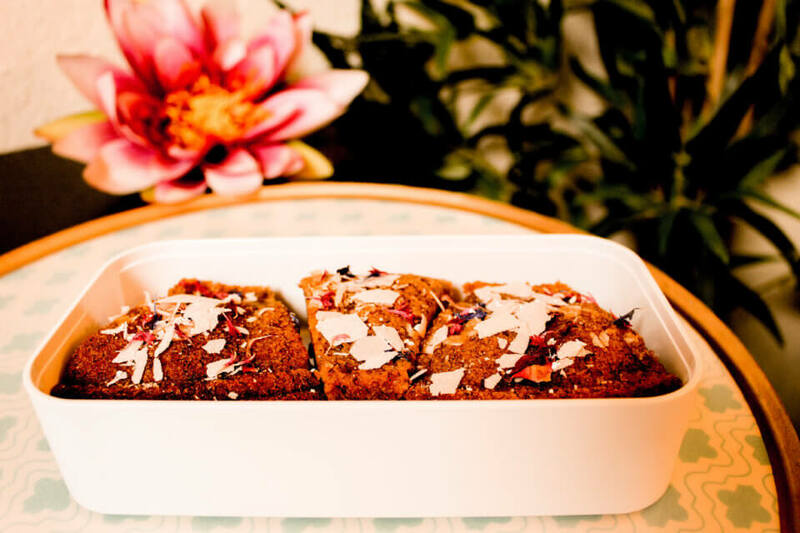 So you might not want to take more fresh food than you can eat on the flight. What I usually take are instant veggie ramen soups. They weigh almost nothing, are good forever and I can’t think of a country where you’re not allowed to bring them, as the veggies are processed. They make a satisfying meal by only adding hot water which you can get in the airplane galleys after the service when the flight attendants are not super busy anymore. Or you can eat it later at your accommodation when the jet lag munchies kick in. Cliff Bars and other factory packed snacks are also super useful and usually unproblematic to bring into a country. Take a look at the snacks that are handed out on board, I have come across things that just so happen to be vegan such as crackers, chips, cookies or even dark chocolate. If you read the ingredients and the snack is not vegan, you can still offer it to the person sitting next to you and might make them very happy. And you’ll be happy if you brought something yummy yourself to snack on. Along with bringing your own food, it is a good idea to bring your own water bottle. It is no problem to go through security with an empty bottle and then fill it, there are little water fountains at many airports. Most flight attendants are happy to pour the water you order in your bottle instead of a plastic cup. Even as a soy latte addict you don’t have to suffer. If you fill plant milk in the above mentioned travel size mini bottles and put them in your plastic bag for liquids, that should be fine to take. Also I recommend glass bottles for plant milk or sauce or salad dressing, because I’ve noticed that plastic bottles start to smell after a while. Also I have discovered vegan instant cappuccino*. The flight attendants usually don’t have hot water on their cart, but if you come to the galley after the service, they will be happy to help you. 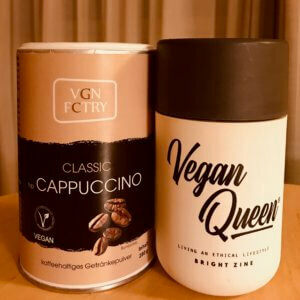 If you have your own tumbler, even better, then you can put the lid on and have hot cappuccino for a while. And no mess on your table in case of turbulence. By the way, did you know German beer is always vegan due to the “Reinheitsgebot”? That means it is prohibited by law to mess around with weird ingredients like fish bladders etc. I don’t recommend replacing food with beer on flights though, because the low air pressure strengthens the effects of alcohol, the body dehydrates and you don’t really move a lot. That will make you feel and act drunk much quicker. A lot of airports offer vegan food options now that the world is becoming more vegan-friendly. 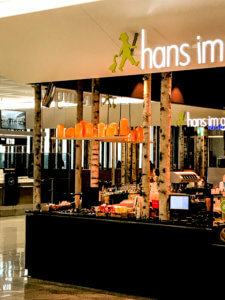 One of my personal favourites is at Munich Airport: burger bar Hans im Glück at Gate K18 next to the food court of Terminal 2’s satellite building. Unfortunately it is only accessible if you have a boarding pass for a flight to a Schengen Country. So if your Gate is at Level K you’re lucky and if you’re at level G you can get there in about 10 Minutes with the little train that connects the main and the satellite building. Hans im Glück has four different vegan burgers, the kind that you can eat without things getting messy. 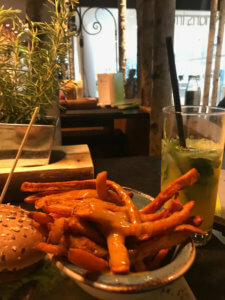 They serve amazing sweet potato fries and fantastic orange mustard sauce. There is a nice seating area and you can even get cocktails. The only thing that’s missing in my opinion would be a coffee with plant based milk, but hopefully that will come at some point. 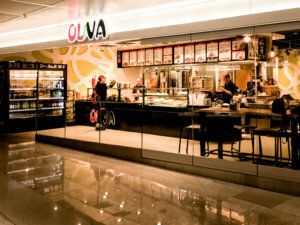 If you have a longer layover and enough time to get outside of security, there’s a good Turkish place called Oliva at arrivals that sells several vegan options. There is also a Starbucks, a Subway, a bakery with clearly labeled vegan items, a little Edeka supermarket and another big one inside Terminal 1, which is even open 24 hours. They all have lots of vegan stuff. When buying something for later, just keep in mind that you have to go through security again. I often buy a falafel at Oliva with no sauce, which has never been a problem at security. Berlin Tegel has a bakery and a coffee shop at A1, both with clearly labeled vegan options, where you can get a nice pastry or sandwich and soy latte. Also some of the areas after security have vegan food like little salads or snacks. I was also positively surprised how many yummy things I found at Fiumicino Airport in Rome. Really good veggie panini and apricot croissants! 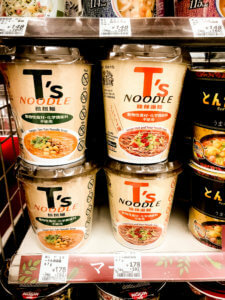 And my favourite Japanese ramen restaurant T’s Tantan which has just opened a place at Tokyo Narita Airport. Or all the great stuff you can get at Pret-a-manger at Airports in the UK! There is even an app called air vegan which will show you what each airport offers, but happy cow will often produce results too. Check out my post on apps for traveling as a vegan. Do you have any tips for flying as a vegan that are missing here? Let me know in the comments. Do you like this post? You can pin it on pinterest by clicking the red button below.